Here's an interesting historical footnote. Announced in the summer of 2011 and launched in 2012, the Jetbook Color was the first ebook reader to feature a color E-ink screen. 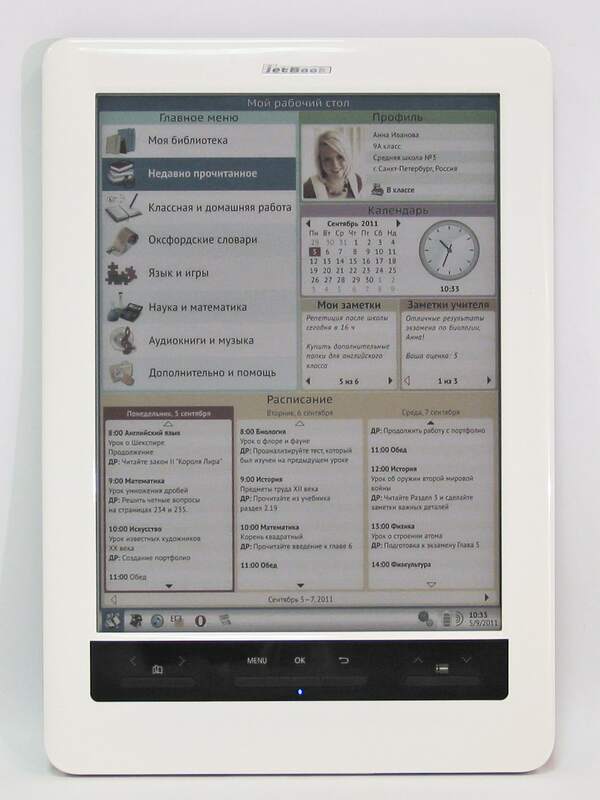 The device came with a 9.7" screen and cost $500, and was targeted primarily at the educational market. The original Jetbook Color was a disappointment when it shipped, and even the two updates from Ectaco improved it slightly. My unit had a gray screen and was never very fast at turning the page. The high price and limited features probably encouraged many to instead invest in an iPad, but in spite of the cool market reception Ectaco pushed ahead, and released an updated model in early 2013. The $500 Jetbook Color 2 had a newer (but still gray) Triton 2 color E-ink screen and otherwise identical hardware, so it is not unreasonable to think that Ectaco could have supported both models. According to their website, Ectaco is still selling the Jetbook Color 2. It's not clear whether the later model is still being updated, but I doubt there are enough sales to justify it. This thing costs more than an iPad and does considerably less, and that simple fact will discourage many potential buyers. Good idea, but tecnology. I don’t understand whit a device like this is not done but the screen Japan Display (the same screen that hasn’t buyers but looks better than this from eink). Mirasol, Plastic Logic, Bridgestone, Triton… seriously is impossible to make a reflective color display quality? We’ll have to wait to Liquavista, ClearInk, etc … but after so many years I start to lose faith. Lol, no. There are at least 5 or 6 people who bought one about the same time I did, and a high school in Brooklyn ran a pilot program with 30. But he could be the last remaining Jetbook owner, that is a possibility. I have had a very good experience with the Jetbook Color. Despite the slow loading pages, reading from an LCD screen is impossible for my eyes. With the Triton screen i can do it for hours without getting tired. I only regret that such technologies do not continue to improve. Is demonstrated that the LED light produces retinal damage, so it is clear that a different technology for color reading is needed. Japan Display? Liquavista? please do something! Ectaco invested to make the product unsalable. Even been slow and expensive, it would have sold a lot if the device could read comics and news magazines natively; it could not, and they made clear they were not interested in making it possible. They could have released an SDK; they did not. Once you discriminate the most interested public, are are condemning yourself. It is that simple!